Nothing More To Say On Brian Williams, Tom Brokaw Says : The Two-Way The former NBC Nightly News anchor's comments came on Fresh Air. Williams, the man who succeeded him, is serving a six-month suspension for exaggerating his experiences in the Iraq War. Tom Brokaw tells Fresh Air that he has nothing more to say about the Brian Williams controversy. 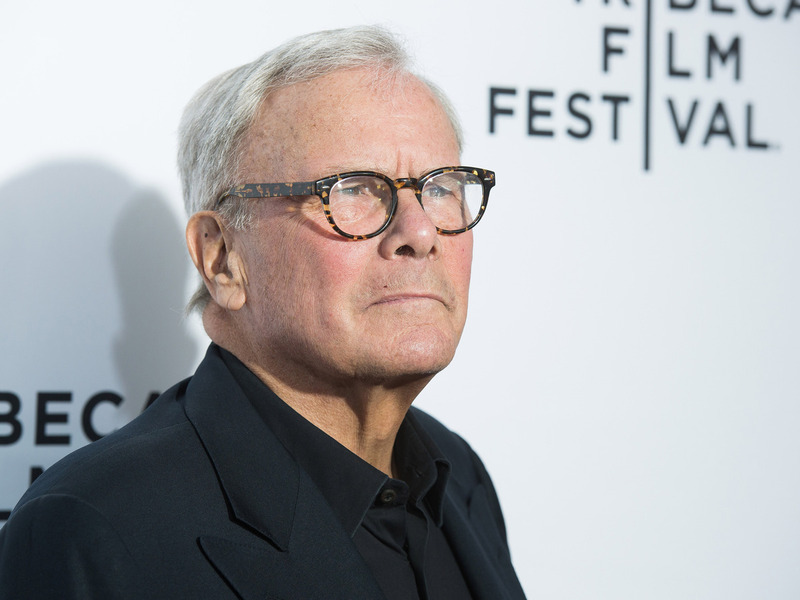 Former NBC Nightly News anchor Tom Brokaw tells Fresh Air's Terry Gross he has said all he wants to say about Brian Williams, the man who succeeded him in the anchor's chair and who is serving a six-month suspension for exaggerating his experiences in the Iraq War. Gross: I just want to start by saying my understanding is you've said all you care to say about Brian Williams, true? Gross: OK. So let's just move on. Much has been made of Brokaw's relationship with Williams. As NPR's David Folkenflik said on All Things Considered in February, the relationship between the two men has "been cool and evolving to frosty." On Monday, Brokaw, who is promoting his new book, told Fox News' Sean Hannity that much of what has been said about his relationship with Williams is wrong. "I read things attributed to me or what my state of mind is — completely wrong, almost all of them," he said. "I hope that this can get worked out to the advantage of everybody, but we've got to let the process play out." Brokaw added that Williams was preparing his response to the scandal that resulted in his suspension from NBC in February. "Brokaw: Yeah, I have an 'L' issue and I think ... over the years [it has] diminished a lot. I was unaware of it until I left South Dakota and then I go back and listen to other people in South Dakota and it's not uncommon. In our family we had chronic hearing loss and I really think that it came out of that, that I didn't hear it the right way at the right time. "I had a brother who had a really severe hearing loss and as a result his speech pattern is even more pronounced although it has been a lot better now. I also grew up in working class neighborhoods where we didn't have speech therapists even though I was known as a kid who was talking all the time on the television and radio all the time, it didn't really come up until I left South Dakota and I had a wonderful speech coach in Omaha who kind of got me started in the right direction and I've worked on it over the years but when I get tired is when it shows up most of all. "Gross: Has it ever been an obstacle in your career? "Brokaw: I don't think so. It has come up in the past but I think people by and large didn't think that it was so acute that it was a distraction. "Gross: When you say you worked on it, what did you do? "Brokaw: I just did exercises, you know, tongue placement and reciting various verses. You can take a word like 'million' and you can substitute 'd's for the 'l's, 'middion,' and if you just use the same thing then 'million' comes out correctly."